Replacing the accrual data inside the database with fictitious data that looks realistic, in most cases after static data masking original data can’t be retrieved. This approach is used when production database or subset of the production database is being copied for non-production use like development QA and testing. Oracle deliver static data masking using grid control – Data Masking Pack. Actual data is changed, original data can’t be accessed if needed. Data Redaction provides selective, on-the-fly redaction of sensitive data in SQL query results prior to display by applications so that unauthorized users cannot view the sensitive data. It enables consistent redaction of database columns across application modules accessing the same database information. Data Redaction minimizes changes to applications because it does not alter actual data in internal database buffers, caches, or storage, and it preserves the original data type and formatting when transformed data is returned to the application. As you can see original data was replaced with zero values, if the redacted column was string, null was returned from redaction policy. 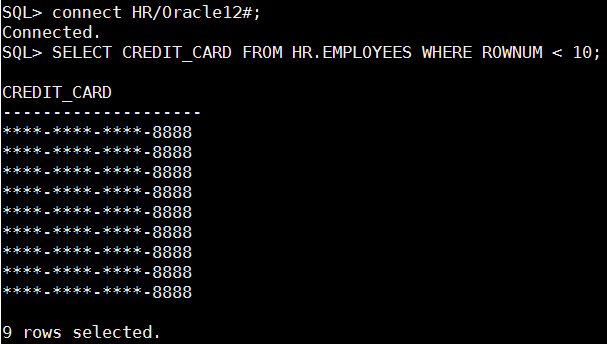 with the following parameters – ‘VVVVFVVVVFVVVVFVVVV,VVVV-VVVV-VVVV-VVVV,,1,12′ – for every row that credit_card data matches this pattern – “VVVVFVVVVFVVVVFVVVV”, replace it with this pattern “VVVV-VVVV-VVVV-VVVV” and replace the first 12 characters with ““. Up until now we have used “expression => ‘1=1’” on all of our redaction policies, this means that data will be reduced whenever the redacted column is accessed. Oracle data redaction can conditionally redact data making original data available for some and redacted for all others. 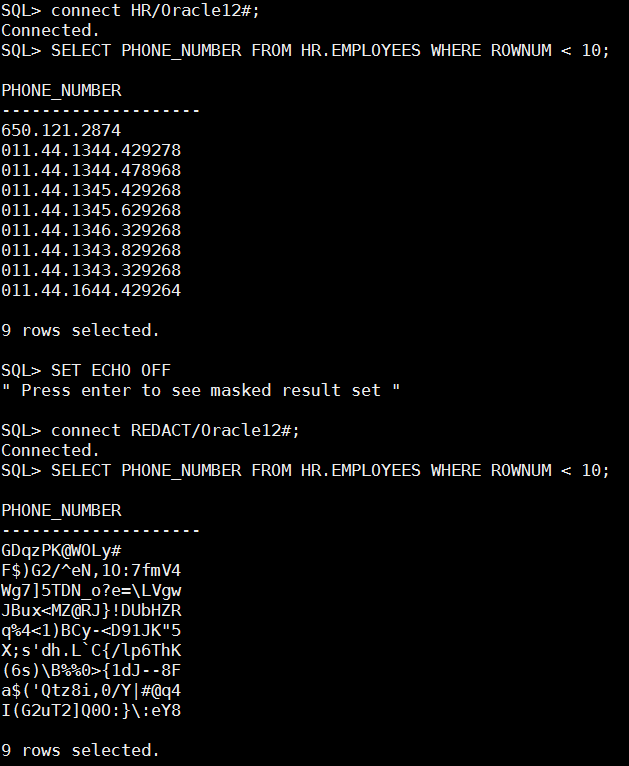 The below policy replaces phone_number column with random values only for database user – REDACT. Notice that when data is queried using user HR original data is retrieved and when REDACT user queries the table data is redacted. Last but not least, DBMS_REDACT provide ALTER_POLICY capabilities to alter existing policies, I can’t show this online but you have to trust me on this one DBMS_REDACT.ALTER_POLICY changes the policy on the fly, next time the redacted object will be accessed new redaction policy will be active, no need to reconnect sessions or restart the data base. Data redaction was introduced on Oracle 12c as a great addition to Oracle database security features providing us the capability to display different data to different people and prevent access to sensitive data on the fly with near zero performance overhead. Until next time, be smart be careful and don’t be afraid to use Oracle database security features. Great explanation to implement redaction in to DB applications.